Darryl Dennard, host of Chicago Speaks (DD): We are extremely proud in having with us the Honorable Minister Louis Farrakhan. Minister Farrakhan, welcome to the program. 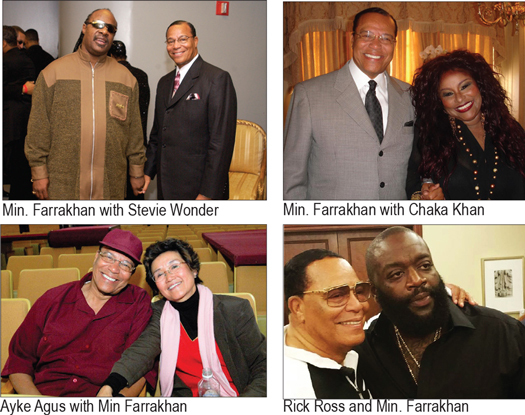 The Honorable Minister Louis Farrakhan (MLF): Thank you so much for having me, brother. DD: The thing we really want to focus on here is your return to your musical roots, in a sense. Talk to me about this whole musical voyage in terms of Let’s Change The World. MLF: In 1974, I brought my violin out to Chicago to the home of the Honorable Elijah Muhammad. I don’t remember what caused me to do that, but at the end of the dinner he asked me if I would play my violin for him. When I played the violin, he looked up at me and he said, “Boy, you really can play that thing!” And two weeks later he called me back to Chicago and told me to bring my violin. So, we had an evening with him and his wife and children, some of his younger children; and then he asked me to play again. I played. I saw this frown on his face. And he said, “Brother, isn’t that the same song you played for me the last time?” I said, “Yes Sir.” He said, “Well don’t you know anything new?” Well, that was a hint: because if he was happy with what I did, and he wanted me to do something new, then maybe I catch “the hint,” and pick my violin up again. So in my 58th year, I picked my violin back up. I got a wonderful teacher, a Jewish woman, Miss [Elaine] Skorodin Fohrman, and she helped me to finish a song, a concerto that I worked on at 17 years of age and never got a chance to complete it. And by the time I was 60 years old, I auditioned for Mr. Michael Morgan, the associate conductor of the Chicago Symphony [Orchestra]; and then I played with the Tri-City Symphony down in Winston-Salem, North Carolina, from Greensboro, Winston-Salem and another town nearby. And then I came back to Chicago and played for my community the Mendelssohn Violin Concerto—and I was back. The New York Times came into the place where I was practicing down in North Carolina; and they wrote a full page in the New York Times about Farrakhan. They asked a question: “Can he play? By God he sure can!” So, I started back at it; and, my love for classical made me start with classical. So a few years later I did the Beethoven Violin Concerto in California with members of the Los Angeles Philharmonic as well. And then the young lady—oh, she’s not a young lady, but a wonderful lady that brought me back into music, her name is Sylvia Olden Lee; you can look her up on Wikipedia. She is a Black woman, but looks very White; and she was the pianist at the inauguration of Harry Truman. MLF: Well, she [would be] in her 100s now. But, she played for Paul Robeson, she played for Marian Anderson, some of the great ones. But she was also hired by the Metropolitan Opera to be a coach for the operatic singers, particularly those who were Black who were coming into The Met. DD: Bobby McFerrin’s father was one of those individuals. In fact, he did the music, he actually did the voice for Sidney Poitier in Porgy and Bess. … His father was an opera singer. DD: We’re going to touch on a lot of stuff this morning, but I really want to focus on the inspiration as you just talked about in terms of these influences that you had. But at the same time, give the audience just the wide expanse of musical genres that exist on this album. Because it is, if I’m not mistaken: a seven-CD set, along with a book? DD: So we’re looking at 14 years ago that it actually started! DD: [Laughs] … Your “Guy Lombardo” for the young and uninformed who have no idea about that. MLF: Yes. … So he said, “Look, I’m going to write an arrangement for you—if you will do it.” I said, “Well, okay, Charles, I’ll do it.” And I thought about the lyric, and I really didn’t think I would be alive when the album came out because of the cancer that I was fighting, but he passed away. And one of his dear friends who is Jerry Peters, who is a Grammy Award-winning brother, that got his Grammy along with Kirk Whalum: both of them are on the album. I asked Jerry Peters would he write what Charles Veal wanted to write, a very special arrangement of “Auld Lang Syne?” And that is a folk song—but the way this man wrote it, and we did it? It features Stephanie Mills singing Auld Lang Syne. DD: Incredible. And we also have compilations from Snoop Dogg; we’ve got compilations featuring Common, as well as some of the other leading rappers. MLF: Deniece Williams. Now, you know, I didn’t know that Deniece sang gospel. DD: Of course! The great Jackie Wilson song. Yes! DD: Of course, definitely—George Lucas, who is married to Melody Hopson. MLF: Yes. And I had already cut the violin part, and when my sister, Deniece Williams, did her part: We talked afterwards; she said, “Farrakhan … So this is the ‘underbelly’ of Louis Farrakhan?” She said, “After hearing the way you play the violin, I was so inspired that the Spirit of God led me to do what I did.” And when it was done, I had her out in Phoenix, and I played it again for her. She broke down and wept; and she said, “Minister, a friend of mine who is a seer said that I was going to do a gospel song, and it was going to be a big hit.” And she said, “I ain’t doing no gospel song!”—then she remembered what she did with me. When you hear it, it is stuff that the Grammys are made of. DD: That sounds incredible. And we want to inform our listening audience right now that all of the music that we’re talking about is available at LCTWmusic.com, the acronym, of course, standing for Let’s Change The World Music. Why did you decide to call the compilation “Let’s Change The World”? What has changed with you over these last two decades, particularly in light [of] when you talked about how 14 years ago you were facing a very, very serious cancer diagnosis? MLF: I want to start where your question started: “What has happened with me over these last decades?” It has been an evolution; because there is a universal aspect to the teachings of the Honorable Elijah Muhammad. But when I was a young preacher under Brother Malcolm it was “Black Man”—all Black, Pan-Africanist. And then one day Mr. Muhammad said, “They call me a ‘Black Nationalist,’ brother, but ‘Black’ is not national, ‘Black’ is universal; everything starts in darkness and then comes out into the light.” When he said these things to me, time goes on, but I see how my music has introduced me to the universal aspect of his teachings. If you study the Bible, Jesus told his disciples, “Go ye not into the way of the Gentiles nor even the Samaritans, but go ye specifically to The Lost Sheep of the House of Israel.” Very narrow focus; “nationalist.” But in the end he says, “Take this gospel to every nation, kindred and tongue”—it became a universal message. DD: And how do you hope this music is going to change the world, and maybe as a byproduct, change the world’s impressions of you? DD: [Laughs] … If that would be the case? MLF: [Laughing] … Oh, brother… Well, you know, I’m in a “prison”—and that’s the prison of negative public opinion. And that negative public opinion has been shaped due to the passion of my speaking a truth to power; but also, in my sitting down with members of the Jewish community, trying to reconcile how we’re going to get along. God, they told me that I would have to have a protracted period of time where they study me. Then I would have to denounce this book that our Research Team put out called The Secret Relationship Between Blacks and Jews, because they said it was a great calumny against the Jewish people. And then they said, “If you do this, we will clean up your image.” You wouldn’t have to clean up my image if you didn’t purposely dirty my image. So when they finished at the rabbi’s house, I said, “Well, let me answer your request. I will renounce the book if you condemn all the Jewish rabbis and scholars and historians that we quoted—because we quoted them in their writings of what they did in the Trans-Atlantic slave trade, etcetera.” I said, “I want to be your friend, but if being your friend means I have to deny the truth, then yours is a friendship I don’t need, yours is a friendship I don’t want.” And from that time, the media: Every time they talk about Farrakhan, “He’s an anti-Semite. He’s a hater. He’s homophobic, he is against the gay community,” and all this. So now I’m in a prison; not with my people so much, but with the rest of the world who follows what the media writes and what the media think—and a lot of my people do the same. But the music is such a universal language: How can a man be a hater and play like that? How could a man be a hater and sing like that? How could a man be a hater and write music like that? I think they’re going to have to rethink their view of me, by God’s Grace. DD: And I would be remiss if I didn’t ask. To look at you—you look great: How are you feeling these days? MLF: By the Grace of God, you know, cancer is a heck of a disease; you beat it today, and it comes back tomorrow if you are not careful. It’s been over 10 years since I had my last operation where they took out my prostate, but my PSA is beginning to rise a little, so they are thinking that there might be a microscopic cell of cancer there; but we are beating that down. So that’s been 10 years now, and I’m still going at it. DD: And I’m fortunate for this program, to have in-depth conversations, and extensive conversations, because this is a topic—and we’re going to get to some other topics, and I appreciate the patience that you’re extending us, Minister. But this is so important, particularly in light of Black men in terms of prostate cancer. And I want you to tell us the importance of getting that PSA [Prostate-Specific Antigen] test. DD: And that was the first time you had a PSA test, at 58? MLF: No, I had one when I was 42. DD: Oh, well, you actually are far from the norm, because many times Black men, myself included, don’t get PSA exams in their 40s, or even in their 50s. They get it when sometimes it’s too late. MLF: Well, that’s the problem! And every Black man should get a PSA test—don’t wait till you’re 40: even in your 30s, as you start getting near 40. Don’t worry about a rectal examination that touches your prostate to help them to feel what the condition of your prostate is. I know if you’re a male and you think you’re a “great man” you don’t want nobody “poking up in your backside”… But let me tell you, man, when my doctor, when I was 42, said: “Have you ever had a prostate exam?” I said, “No sir.” Well, he gave me that exam; he says: “Your prostate right now is like that of a 16-year-old”—and I never got another prostate exam. This is in New York that I had the first one. I came to Chicago, and my doctor here said, “When is the last time you had one?” I told him: “When I was 42”—I’m now 58—he said, “Well, you better get another one.” I saw the look on his face after he did it, and then we had the biopsy, and I had cancer. DD: Wow. What was your PSA level at that time, do you know? DD: Eight or 9, you mean? MLF: Oh yeah, I was messed up. DD: [Laughing] The conspiracy theorists won in that case, huh? MLF: Uh, yes. [Laughs]… I went down to Mexico, and I had a doctor, and he looked at me and said: “Farrakhan, you have an enemy in your house; he is a robber, now. But if you don’t get him now when he’s a robber, soon he’s going to be a killer.” So I came back and I went into Washington, D.C., at Howard University Hospital. DD: I remember that; I covered that. MLF: And I had what they call “seed implantation,” radiated seeds, as a protocol; and it knocked it down from where it was. And I mean, it was very high! It went down below four, so I was winning, but like these things do, they came back. In a few years later it came back again, and they radiated me with 180 more seeds—and that was not necessary, unfortunately, and it began burning up my insides. And so here I am today: They never thought I would live through it. DD: And tell the audience how old you are now, Minister. MLF: I’m 85 today, by God’s Grace. DD: You look incredible, sir. DD: There are so many things that are happening. First of all, you know, almost as though it was a “word association test”: Where do we stand right now in America under the Trump administration? MLF: It depends on how you look at it. The way I look at it? I think we’re in pretty good shape. DD: When we look at Charlottesville, and things of that nature? MLF: So here we are now, in this thing where people are literally killing Black youth, and it’s like an epidemic, or pandemic, now. Our young people are under assault because they are fearless! MLF: So when you take the factories out of the inner cities, and you introduce drugs as the means of economic survival, and gangs, and then turning our young girls into prostitution, we are destroying our community. But the “kick in the behind” from a man like Trump is forcing us to see we need each other. DD: In terms of his opioid addiction. MLF: Yes. He said, “I would rather call it a ‘break through’.” So, as you are listening to him in his discourse with T.I., [Kanye] is wrestling with trying to be free of constraints: mental constraints, societal constraints; things that people think we should do, he may want to break free from that. So when he heard 400 years of slavery, he said: “Man, somebody’s a slave that long? They must have wanted, chose that.” But the choice was not made by us; the choice was made by God—and we were fulfilling prophecy: “Know of a surety, Abraham, that your seed is going to be a stranger in a land that is not theirs, and they shall serve them and they shall afflict them 400 years. But after that time I will come, and judge that nation which they shall serve, and afterwards they are going to come out with great substance.” So, he didn’t know that choice; it was not ours, it was God’s. But we can choose, now, to stay mentally chained to drugs and crime, and disrespect of our women, and all the things that make us less than what God intended for us to be—that’s a “choice,” now, because the truth has come so that “the chain” of White supremacy and ignorance can be broken! But “the chain” of drugs, and this “sexual revolution,” if you will, has us thinking more of pleasure than we think of the progress of real pleasure through economic development. DD: As we get ready to close out, I’d love to get your comments on two Chicago themes. The first being where do we currently stand with regard to trying to come up with answers to this plague of crime in Chicago? MLF: … entity, in the world. But what have we done with the money that has come through our hands when we have no factories to produce what we consume, what we wear? We are not building. We are an international people, but we are not engaged in trade and commerce to enrich ourselves. So it’s an economic problem based on a mental “chain” of consumerism, and that’s a chain that we have to break. That’s a “chain” that those who have benefited from our being a consumer nation rather than a producing nation, that’s the “chain” they want to keep on us. And I hope that’s the chain that we want to break, and that’s a choice that we have to make. DD: And that will help to address the crime in Chicago? DD: Some of it. And I also want to get your take on the upcoming mayoral election. You’ve got almost 10 people declared to run for mayor in Chicago. MLF: How many of them are Black? DD: At least five, if not six. MLF: Well, you know, as long as we all are running for the same office, then our power is divided. But if we really want to be mayor, we should sit down in a room and ask ourselves which one of us is the most qualified to represent us and the city? “Which one of us?” If it’s just a vain thing (“I just want to be mayor because I want to be mayor, but I am not qualified”), well then we have to say: “Brother, why don’t you step out?” If we can agree that “Brother A” or “Brother B” or “Brother C,” or “Sister C,” is the best qualified, let’s all put our eggs in that basket and run, and we might have a Black mayor coming up again. DD: And finally, we know that you have a message for the Black man, but on Mother’s Day weekend, what is the message for not only Black women, but for all women? And mothers in particular? HMLF: First, I wouldn’t be who and what I am if it were not for my illustrious mother. I didn’t know my father; I know I had one, and I love him, and I honor the seed that went into my mother’s womb to produce me, but I am the product of my mother and all the forces that are in my life that made me the man that I am today. There is no power greater than the power of mother. So, Prophet Muhammad, peace be upon him, said: “Heaven lies at the foot of mother.” Well, the Bible says, “How beautiful are the feet of him who publisheth peace?” If you want the peace of Jesus Christ, or the peace of God, you come to the foot of The Great Messiah. If you want heaven while you live, that same foot, a Messianic foot, will teach you the honor and respect of women, particularly your mother. And if you honor your mother, and honor your father, God will bless your life. So this Mother’s Day, don’t make it just “a day”: we honor mother every single day of our lives. So every mother listening: May God bless you, and May God protect you—and protect your offspring—because you’re mothering children that are at risk in a world like this unless we come together and change the world. 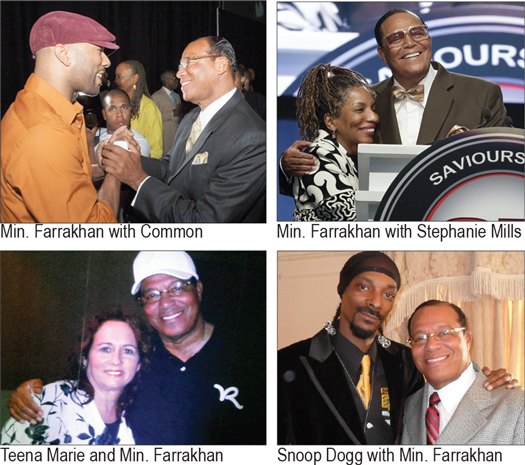 DD: And speaking of “change the world,” we thank you so much Minister Farrakhan. People can get the [newly-released] compilation CD box set as well as booklet there by visiting LCTWmusic.com. Minister Farrakhan, it is indeed a pleasure to talk with you this morning. HMLF: Brother, thank you. And to all your listeners, thank you so much for allowing us to share this time with you with our host. God bless.